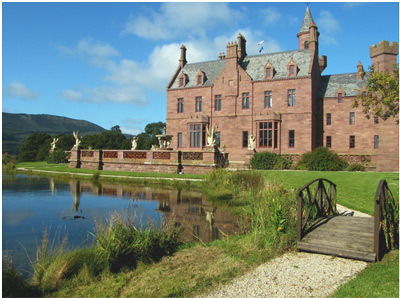 Castle Oliver is a stunning Irish castle built in1843 as a private residence for Mary and Elizabeth Oliver-Gascoigne. In 1852 Elizabeth married Lord Ashtown and it became known as the home of Lord and Lady Ashtown. Today it remains a private castle and is available to hire exclusively for your special occasion giving you all the benefits of a private house where unlike a hotel the only guests present are those you invite. When you rent Castle Oliver it is for the exclusive use of the castle and grounds. Set on 15 acres of private gardens and woodland with its own lake it creates an ideal location for your memorable photographs. The castles backdrop is equally spectacular for a drinks reception with the mythical stone griffins keeping watch at every event. Castle Oliver is a fairytale castle with battlements; turrets and a flag tower, built with local red sandstone it hosts a magnificent Ballroom with antique chandeliers and a period fireplace creating the perfect setting for your wedding reception. The baronial dining room is ideal for a candlelit diner for the bridal party the night before or after the wedding. Retire to the Billiards room or enjoy a night cap in the owners private Library, these rooms will be enjoyed by your guests on your wedding day while enjoying a drink and conversation after the reception. The cost to hire this enchanting castle for two nights is 3500 euros which includes complimentary use of the bridal suite with its lavishly carved 6ft four poster bed. There are four other superior en-suite rooms in the main castle. These rooms include newly commissioned hand carved four poster beds and luxurious en-suite bathrooms with large antique bathtubs. Three deluxe en-suite rooms are available on a separate wing of the castle The overall cost for renting these rooms for the two nights is 3200 euros and all seven rooms must be booked as part of the wedding package. Continental breakfast is included for all 16 guests. We can recommend accommodation for your additional guests in local hotels, guesthouses and self catering houses on request. If you would like to list your property on this website contact feedback@castlesinireland.com for more details.